Kerwin was a PEPLUM star. He appeared in THE 7TH VOYAGE OF SINBAD, SAPPHO - THE VENUS OF LESBOS, THE 3 WORLDS OF GULLIVER and this film. It's a fun film but it's no 7TH VOYAGE OF SINBAD. Kerwin will always be remembered for that film, and in my case, SAPPHO, which is one of my faves. 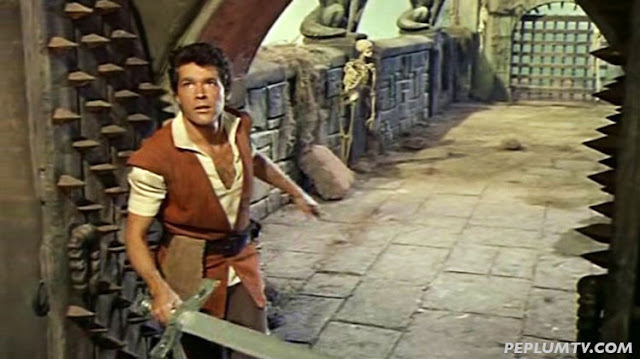 Though Jack the Giant Killer was purposefully contrived to ape The 7th Voyage of Sinbad, I still have a soft spot for this movie, and many of the effects are colorful and engaging. I conversed a while ago over the Internet with stop-motion animator Jim Danforth, who did the two-headed giant vs sea monster scene, as well as the animation of both the flying dragon and the Kerwin Mathews puppet at the end. He had lots of fun information, and he remains one of my FX idols. That "Viking" sword, by the way, is the same wielded by James Mason as the villain in Prince Valiant (1954).